A precious gem of Renaissance Florence to the Florentine tradition of Rabatti family wanted to share with his guests. In the heart of the city, lemon scents, centenary palms and the shade of the olive trees of the pretty inner garden offer an unforgettable escape from the everyday life. House Rabatti awaits you in an ancient palace, in 800 transformed, and today equipped with all the amenities for you to enjoy an unforgettable experience enlivened by a family atmosphere and friendly, offering ideal solutions for short or long period. To be added 40 euros for final cleaning to be paid in cash together with the tourist tax upon arrival. A beautiful apartment ideally positioned for exploring Florence, within 10 minutes walking you are in the heart of this historic city. The apartment is well appointed with all you need and has the added bonus of a lovely courtyard garden in which we very much enjoyed having a lazy lunch and a relaxing glass of wine. The entire experience of renting is stress free with Sergio contacting you in advance to arrange meeting you and showing you the apartment. No review would be complete without a mention of mother who lives above and is a delight to meet and has boundless energy. The location is ideal with Florances main food market just 5 minutes away providing the best Tuscan food of all varieties for you to buy. There are plentiful restaurants within minutes offering fabulous local favours from the eponymous Florentine steak to simple but flavour packed Pizza. Awesome location to experience Florence! We stayed for 10 nights and really enjoyed our stay. Marcello and Sergio made us feel very welcome. Any questions or issues we had, Sergio was quick to respond. The patio was a nice place to relax with a glass after a day of sight seeing. This is a well appointed apartment with up-to-date fixtures and appliances. It also uses a smart card for overhead lighting and TV. The apartment is clean and bright. Double doors open onto a lovely garden. A couple of outstanding things - There is no street noise here, which is a true gift in Florence. Yet the locale is convenient to major sights and the Mercato Centrale. My stay was three weeks so I chose to cook in a lot. The kitchen is fully equipped for this. So access to groceries was helpful, whether at the Mercato or the various stores in the neighborhood. Probably the best part of this are the hosts, Patricia and Sergio, and Patricia's mother, Marcella. They made me feel at home and were so kind. And they will respond immediately to any concerns you have about the unit. Do not hesitate to rent this unit. It is suitable for one or two people. If I return to Florence and the place is available, it's where I'll be. Mille graze Patricia, Sergio y Marcella! Hi Nancy, I received your review and I want to thank you for the beautiful words you wrote. So, hoping to see you again in the future we wish you all the best. Bye from Sergio, Patrizia and Marcella. We loved our stay in beautiful Florence! The apartment is well located, just a short walk from everything but quiet and very secure. Sergio, Patrizia and Marcella were the perfect hosts who checked on us almost daily, left fresh towels every few days and made sure that we had everything that we needed. I had an early flight and there was no problem checking in before the usual time. My husband and I booked the apartment for a visit with our son, who was wrapping up his study abroad time in Florence. There was a change of plans with his final travel schedule and he ended up having to stay with us for the last 5 days of our stay. Sergio was very accommodating and our son was able to use the pull out sofa in the apartment for just a little extra fee. While we didn't cook, we did enjoy making our morning moka on the stove and drinking it on the patio. We usually ended every evening with a glass of wine on the patio as well. For us spoiled Americans, the shower was heaven! Roomier than most in Europe and it had a rain shower head with great pressure. The washer across the hall was very helpful as we did not have to over pack. We were even given a nice bottle of wine to enjoy on our last nights at the apartment! Our only regret was that we did not get a picture with our hosts and did not get to say a final goodbye to Marcella. We enjoyed our conversations with Marcella- though I'm not sure how we managed those conversations as she speaks very little English and we speak and understand Italian even less! Thanks for a great visit! Everything we could have wished for. We loved our stay in this appartment: light, airy, very comfortable, well appointed, a pretty sheltered garden to eat out in. Central to everything you want to see and do in Florence and with the wonderful indoor market nearby. Sergio, Marcella and Patrizia are the loveliest people. We very much hope to return and see them again. Hi Mary, thanks very much for your review and we all hope to see you again in Florence. At the moment the weather is always good and sunny. Warmless greetings to John, too. 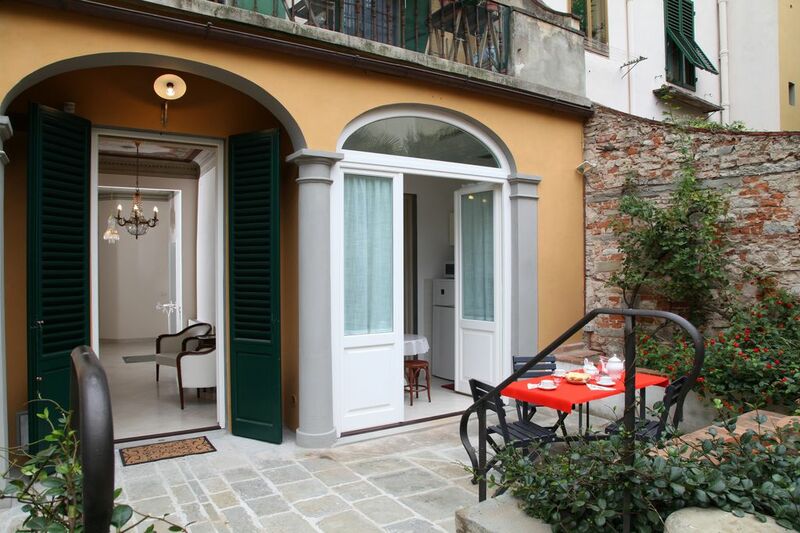 We had a wonderful weeks stay in this beautiful apartment in the centre of Florence. Sergio, his wife Patricia and her mum Marcella were there to meet us on our arrival. The apartment is even nicer than it looks on the photos; spotlessly clean and stylish. The icing on the cake is the pretty garden shared with just one other apartment, a delight to relax in after a hard days visits to the museums and galleries in the city. The apartment is about a 10 to 15 minute walk to attractions such as the Duomo and Uffizi Gallery and very close to the wonderful market where you can enjoy the cheapest cappuccino in town - one euro fifty a cup and also a great place to buy anything you need if you want to cook for yourselves or try all the different little food stalls they have there. The family are really helpful if there's is anything you need and able to help with recommendations for local restaurants and shops. Just got home and missing this sunny little apartment already. Hi Victoria, I read your wonderfull rewiew and I want to thank you. We are glad you felt so good in our location and hoping to see you again in the future, we wish you all the best.